Rolling Meadows, IL - Solidyne Corporation introduced the new i3-3220 Browser Based Control System developed especially for jobs requiring less than 1400 points, with between 25-35 nodes, dependent on the number of data logs required. The i3-3220 is priced to allow the small building manager the freedom and efficiency to access and change their system schedules or set points via the internet - Worldwide! The i3-3220 provides the same graphical user interface as our original i3 using any standard web browser i.e. Microsoft Internet Explorer or Netscape Navigator. 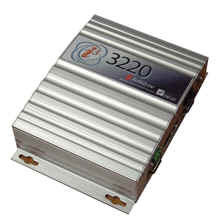 The i3-3220 is easily customized to the building managers' individual needs, allowing connection to their IZAC Network over the Internet or Ethernet. As a true Linux network host, the i3-3220 provides the security and stability to safely manage your building system. Solidyne's small but mighty i3-3220 provides a complete TCP/IP browser based control and monitoring system. Andover, Mass. - Andover Controls Corporation, a leading manufacturer of "Intelligent Building Systems" for HVAC, security management, and digital video surveillance applications, announces the release of a compact and low-cost fan coil/heat pump controller. The Continuum® 887 Terminal Controller, although low in price and small in size, is fully programmable, easy to install, and has power and flexibility for the most challenging control applications. The 887 is ideal for direct control of fans, staged heating and cooling and monitoring of room temperatures, outside air temperature, return air temperature, or occupancy status. The controller offers a unique mix of three universal inputs, five digital outputs, and an additional input to support Andover's Smart Sensor, or any standard room temperature sensor. Manchester, NH - Panorama 8.0, the newest version of the Panorama graphical user interface software from Teletrol, offers an easier, more powerful, and now web-enabled way to manage your facility. Teletrol Systems Inc., an industry leader in building automation technology, announced the immediate availability of Panorama Version 8.0, the latest release of Teletrol's powerful and scalable graphical user interface for monitoring and controlling building automation systems. Now featuring the web integration of PanoWeb Server, Panorama 8.0 allows facility managers and owners greater access to their systems via remote devices such as laptops and PC workstations. SANTA CLARA, CA - The Watt Stopper's TS-400 series digital time switches automatically turn lights off after a preset, user-selectable time out setting. The switches, available in both line and low voltage models, feature terminal style wiring for easy installation and offer users convenient push-button control without the nuisance of twist timers. The TS-400 (low voltage) and TS-400-24 (line voltage) replace existing wall switches. Users press the ON/OFF button to turn lights on. The switch counts down the time from the preset time-out period (5 minutes to 12 hours) and turns lights off when the time expires. Users can turn lights off during the countdown using the ON/OFF button. An LCD indicates time remaining and an optional alert warns occupants of impending shut-off. A time scroll option allows users to scroll up or down through the possible time-out periods, temporarily overriding the time-out period. Setting the time-out for two hours and time scroll to down allows for California's Title 24 compliance for using override switches. Zonex Systems fills a huge market niche with the ZonexCommander. The ZonexCommander communicates remotely with 1-80 rooftops, units, splits, or zones, providing the contractor with a product that fills a large and profitable void between programmable thermostats and energy management systems. The system incorporates the industry's most basic Windows® software providing Internet access with every thermostat or modulating zone in the system. Additionally, signage, parking lot lights, exhaust fans or other devices can be controlled and scheduled remotely or on site. Return and discharge air temperatures are also viewed remotely. The ZonexCommander can be utilized in new or retrofit light commercial applications where remote system control and monitoring are required. This product also provides the service contractor with a simple, low cost tool to monitor and troubleshoot jobs remotely. This is a 4 wire system; two communication wires and two power wires simplify installation time and costs. Low Pressure Transducers The LP1 Low Pressure Transmitter can be used to measure positive, negative or differential pressure in the ranges of 0.25”wc to 12”wc (50 TO 2000Pa). Gauge pressure transducers for a variety of applications. A product for monitoring, testing and analyzing the Home Control Network’s activity at different communication levels. Users can benefit from advanced features such as capturing live sessions of network activity, building own filters and filtering traffic, detailed parsing of data packets, off-line analysis, EHS-devices emulation etc. HCNAnalyzer consists of specialized firmware and software working in combination with one another. The firmware runs on a HCN Node PL132/RS232-100 connected to the EHS-KONNEX network. The software is a windows application running on Windows® 98/ME/NT/2000/XP and uses an RS-232 interface to connect to the HCN Node. The controller is intended to steering a ventilation system or the system of giving CO2 for the purpose of holdings the required concentration of the carbon dioxide in the air. The controller possesses the built-in relay about the large load-carrying capacity , what lets on the direct steering with the electric CO2 valve.The controller possesses the analog output 0 -10V, permissive on using of him as the sensor of the level of carbon dioxide. A low-cost device for remote control and monitoring of home appliances. 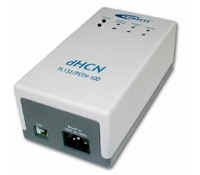 dHCN is designed for direct, immediate phone, cell-phone or pager notification via a regular telephone line. It is connected to and powered from the EHS/KNX-A network and to a normal telephone/ISDN line. dHCN is an interoperable consumer product with simple installation and easy configuration. Precision Air Technology, Inc., Kirkland, WA, has introduced a low-cost money-saving monitoring device that eliminates guesswork in air filter replacement for HVAC systems. The Filtrometer™ Air Filter Monitor is a breakthrough system that eliminates guesswork in knowing when to replace furnace and air conditioning filters. It provides precise detection of filter status regardless of the changes in airflow. Benefits include: Substantial savings from premature replacement of filters; Enhanced indoor air quality through timely filter replacement; Elimination of unnecessary service calls to monitor and maintain filtration systems; Detection of wrong filters. The Filtrometer is designed for easy installation between the fan and the filter bank. It operates accurately in both constant and variable airflow. It adapts to original equipment or can be added to an existing system. Contemporary Controls introduces an Ethernet switch for building automation systems (BAS) which is designed for DIN-rail mounting: the EIBA5-100T/R. 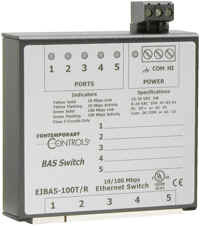 Similar to its companion, the EIBA5-100T for panel mounting, this BAS Switch provides simple and dependable operation, low-voltage input power and low-cost. The EIBA5-100T/R provides five 10/100 Mbps shielded RJ-45 ports which support features that require no operator intervention, making it truly plug and play. It also answers the call for convenient mounting in control panels. It is intended for sub-panel mounting and can be powered from the same control transformer that is used to power the other BAS equipment, making installation neat and rugged. To learn more just read the data sheet at http://www.ccontrols.com/pdf/TD0306000D.pdf. (Hillsboro, OR) - Obvius LLC has introduced the first energy information solution designed for installation by electrical contractors and building owners, without the need for costly systems integration and specialized software. 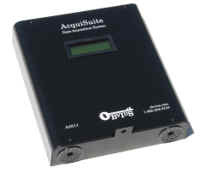 The AcquiSuiteÔ data acquisition server (DAS) provides "plug and play" connectivity to meters from companies such as Power Measurement, Ltd., Square D, Veris Industries, E-MON and Siemens as well as any pulse output electrical, gas or water meter (up to 32 meters per AcquiSuiteÔ). The DAS installs in minutes and uses either an existing LAN connection or phone line to upload data via the Web to the Building Manager Online (BMO) website. Energy consumption information is stored in user-selected intervals from 1 to 60 minutes and is typically sent to the BMO website on an hourly or daily basis.